At Adirondack Weddings, we love the holiday season—not only because of the joy of gathering with family and loved ones, but also because it’s a popular time for marriage proposals! Over the past few days, our Facebook feeds have been buzzing with news of Christmas engagements. For these happy couples, we have a suggestion for you: it’s time to celebrate! Whether you’re throwing a New Year’s Eve party, a shower, an engagement announcement party, or simply having friends over for cocktails, here are a few tips to help make your soirée spectacular. This part’s easy! If your home isn’t already decorated for the holidays, seasonal décor is inexpensive to buy or create. Make your home warm and inviting with glossy gemstone-colored ornaments that glimmer when the light hits them, mason jars filled with flickering white candles , and red satin ribbon wrapped around the backs of tall chairs. Don’t forget the fresh mistletoe above the doorway. Make your tabletop festive by spreading shiny snowflake confetti across the surface. Want an easy centerpiece idea? Fill large glass bowls or vases with your favorite tree ornaments . Before nestling candles into mason jars , coat the jar bottoms with a layer of kosher salt —it will look like snow! Choose plates, glasses, and linens to coordinate with your color scheme. There are plenty of holiday sets available this time of year, both real and disposable. Speaking of colors, don’t feel boxed in by the traditional green-and-red combination. Blue and white or silver and gold also create a warm wintertime feel. You can mix metals, like gold, silver, or bronze, with a bold color. For example, combine blue with silver, or emerald green with gold. Or pair winter white with a deep gemstone tone, like dark purple. Christmas tree ornaments can be more than simple decorations—they can also serve as a guestbook on which friends and family can jot down sentiments and advice for the party’s hosts. Fill a table with felt-tip pens and plain, writeable ornaments. When it comes to non-traditional guestbook alternatives, your imagination is the limit! For instance, have guests sign a Christmas tree skirt, a wooden hope chest, or even a tablecloth. For a holiday-themed crudité, create an edible Christmas tree by sticking small heads of broccoli and cherry tomatoes on toothpicks into a foam tree. Use cookie cutters to cut out bite-sized finger sandwiches in merry shapes. Make sure your guests save room for dessert, because that’s where the spread really gets jolly. Get into the holiday spirit with chocolate peppermint cupcakes, white powdered donuts, and gingerbread men. Serve eggnog and hot chocolate garnished with marshmallows, cinnamon sticks, and powered cinnamon. If your friends and family are “foodies,” ask everyone ahead of time to bring their favorite seasonal recipe written on an index card to exchange with another guest at the party. It will be a great icebreaker and topic of conversation for guests who don’t know each other. If you have enough time before your party to mail invites, the plethora of cards available at this time of year make it easy and inexpensive. Grab a few packs of holiday cards and slip an insert into them with the invite and details. Don’t forget to include the time and date, location with directions, and if applicable, gift registry information. Wishing a happy and safe New Year to all, and warm congrats to our newly-engaged couples! —Story by Lindsay Pietroluongo, contributor to Adirondack Weddings Magazine, with additional reporting by Laura Ward, editor of Adirondack Weddings Magazine. 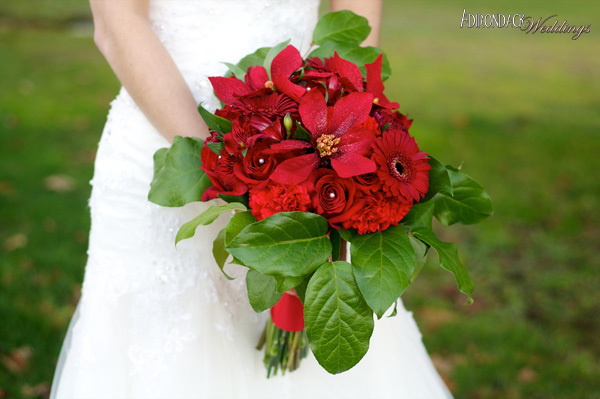 Winter bouquet photo by Greer Cicarelli Photography. These are some really great ideas! It’s not even that time of year yet but it sounds like so much fun to decorate like this and it makes me want to break out the arts and crafts! I love the color scheme reference in this article. Often with the holiday season I feel trapped to stick with red and green colors when decorating. I like the idea of mixing gold, silver and bronze colors; I never thought of this before but this does give a winter holiday feel! I am excited for another season in the Adirondacks and thanks to this article I have many good ideas for a holiday party. Christmas is a big deal for my family, and it is always pretty grand. Even though its March, its always good to get new ideas for that wonderful time of the year. The recipe card swap and the Christmas ball guest book are some things I will keep in mind when I’m planning my Christmas party later this year.